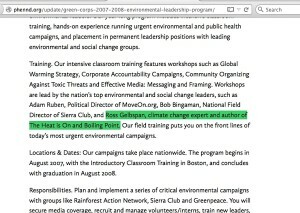 Embellishing credentials is an exceptionally bad idea, whether it’s done in self-promotion, or or done deliberately to hoodwink the public, or done mistakenly because someone didn’t do elemental fact-checking. 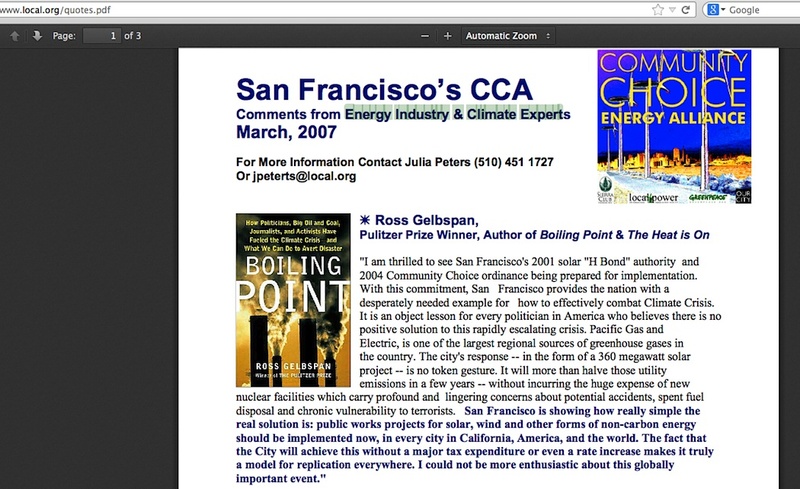 Yet in the global warming issue, we see instances where a major organization promoted the chairman of the Intergovernmental Panel on Climate Change (IPCC) as a Nobel laureate when he is not, and another organization similarly promoting a prominent IPCC scientist as a Nobel laureate when he is not, and the long-term promotion of book author Ross Gelbspan as a Pulitzer winner when he is not, a problem first revealed long ago by Steve Milloy and expanded upon at this blog. 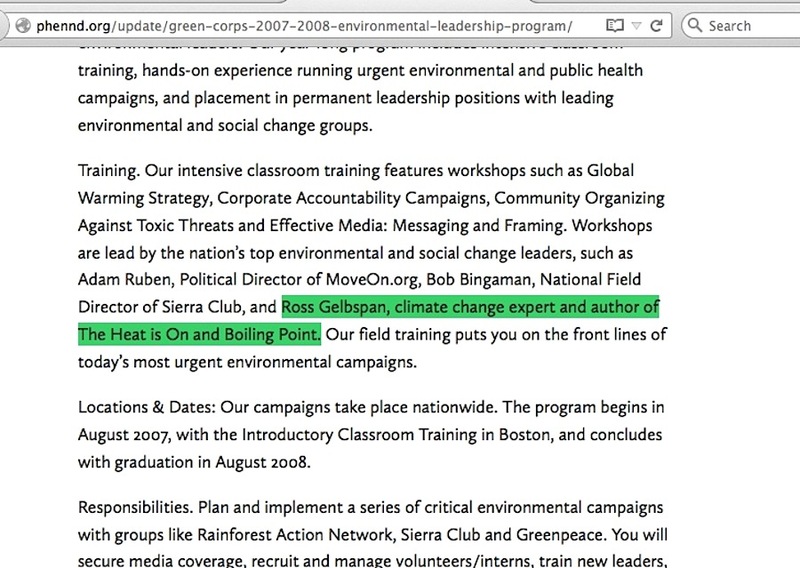 But now, let’s examine Gelbspan’s other small problem, the “Climate Change Expert” label. 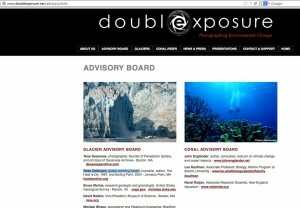 Screencaptures are worth a thousand words – click on each to enlarge it. 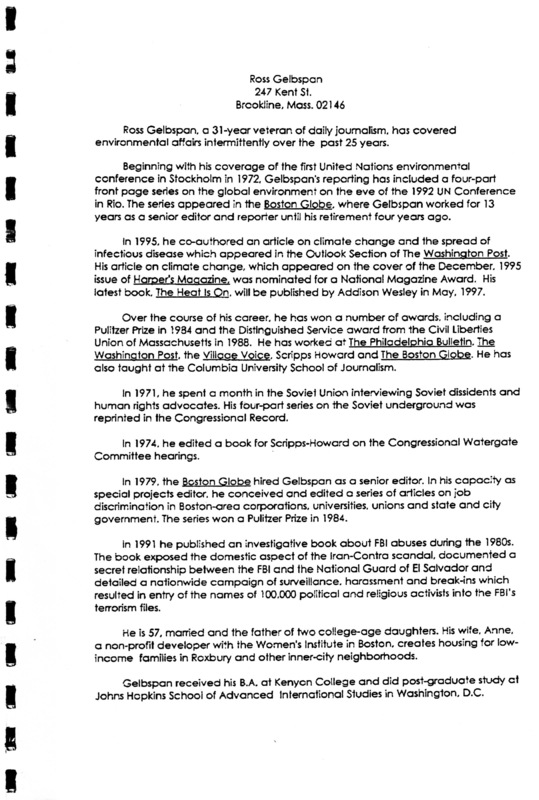 First, we have the note at the bottom of the “Impact and Awards” sidebar on pg 4 of the Center for Public Integrity’s December 2009 “Public i” newsletter, proclaiming Gelbspan to be an “expert on global warming“. 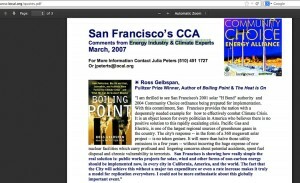 And for good measure, a web site documenting ‘a dramatically warming earth’ where Gelbspan is a “global warming expert” on their Glacier Advisory Board. 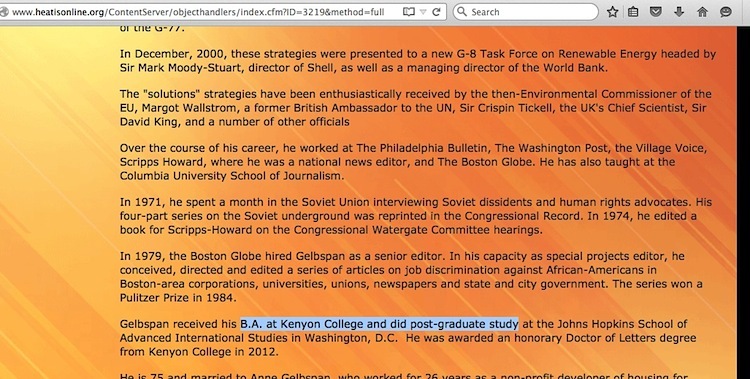 Keep in mind what Gelbspan says at his own web site, and at his 1996-7 era bio, he is a retired reporter / editor having only a B.A. degree and some “post-graduate study” in the area of global politics/community service. 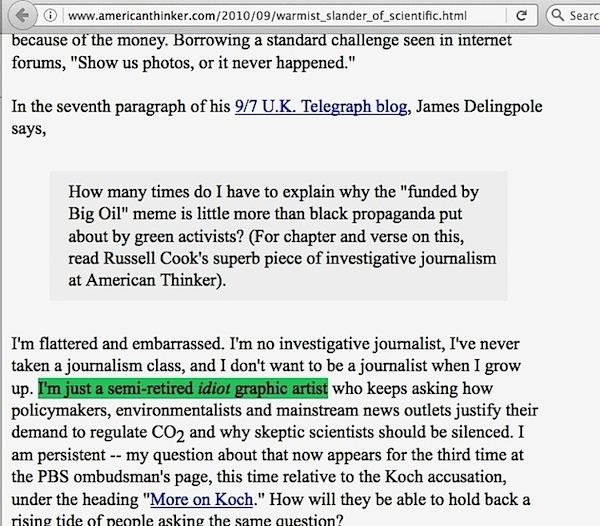 He has no degrees in science, nor any demonstrated in-depth comprehension of specialized climate science areas. With his long-term out-of-hand dismissal of skeptic scientists’ work, it is plausible that I have more knowledge of the issue than he does – both sides of it. Now let me interject a personal note, to set up the problem in the final screencapture below. 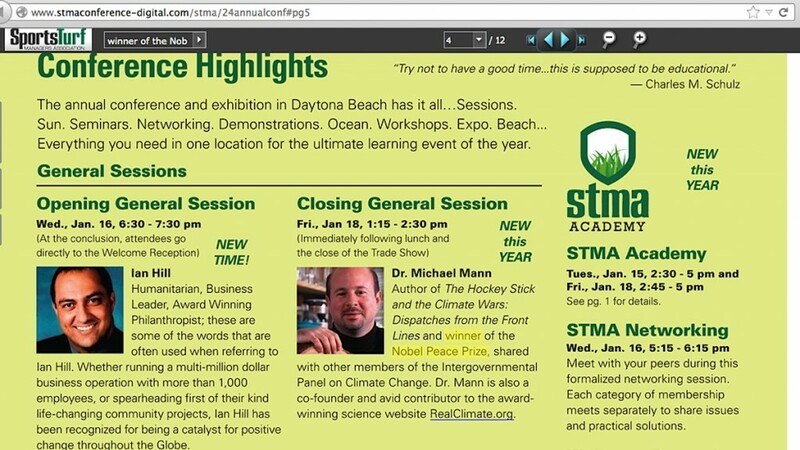 In a manner hardly different than Greenpeace’s page of experts,* [12/5/17 Author’s edit: broken link, works here] the Heartland Institute has pages for its topic experts, and I still find it rather amusing that I am among them here. * [3/7/17 Author’s edit: More recently, Heartland has renamed its people collection as “Who We Are,” thus I must now refer to the archive link where I was labeled as an “expert.] In my 9/15/10 AmericanThinker article, I said in self-deprecation, “I’m just a semi-retired idiot graphic artist”, and regarding my designation as ‘topic expert’ at Heartland, I advocated for a non-traditional clarification about that early on. It was overruled in favor of their standard curriculum vitae format. At least I gave it a shot. Therein lies a problem for Gelbspan: given all those mentions of him being an “expert”, especially when an uninformed person might misinterpret them, where has he rejected or corrected those labels? And what explains all those other numerous instances where he apparently decided not to offer his “Pulitzer co-recipient” backpedal tactic? 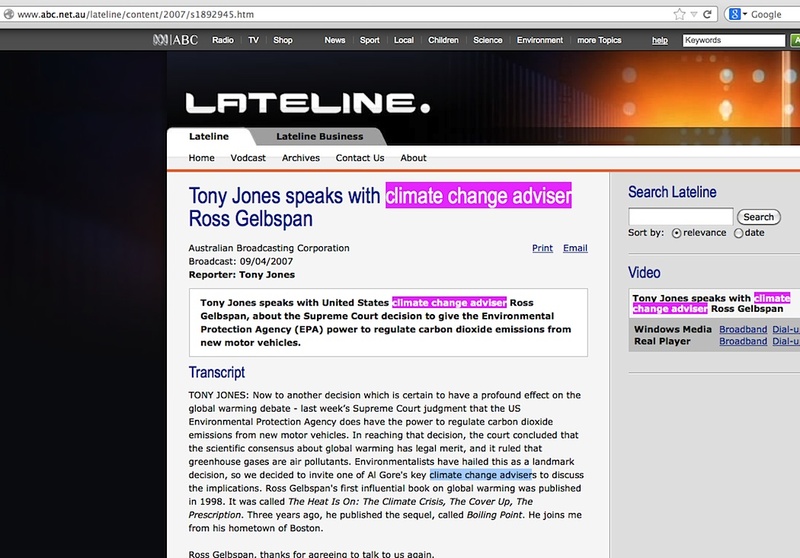 The problem comes home to roost with this screencapture, where we are told on no uncertain terms that he was “one of Al Gore’s key climate change advisers“. 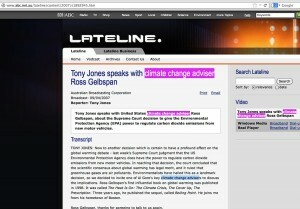 With no science expertise to speak of, and likely little knowledge or comprehension of skeptic scientists’ detailed assessments, how could he possibly deserve the label of “key climate change adviser”? Now consider how well this could work out for Al Gore, if the science conclusions of the IPCC collapse in the face of overwhelming criticism from skeptic climate scientists. All he needs to say is he was misled by a charismatic reporter who passed himself off as a Pulitzer winner. For good measure, Gore could also say he was misled by one other person having too close of ties to Gelbspan, Kalee Kreider. This entry was posted in Embellishments, Narrative derailment, Pulitzer Prize and tagged Al Gore, Kalee Kreider, Michael Mann, Rajendra Pachauri by Russell Cook. Bookmark the permalink.